Huber is excited to add MoldX® P18 ATH to its already outstanding line-up of MoldX products, which allow formulators to use higher levels of ATH in formulations while providing excellent processing and mold flow. MoldX P18 is non-halogen and allows for higher loadings in fiberglass-reinforced polyester applications, including pultrusion, resin infusion, filament winding and vacuum bag molding. It is engineered to have outstanding processing because the ATH particles flow easily throughout the fiberglass in the system. An optimized particle size distribution with a small particle top size is a major advance for pultrusion. 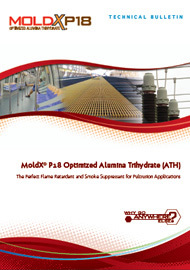 The pultruder can obtain a very low pull force at a high glass content (>60% by weight) with a MoldX P18-based formulation especially when compared to other standard ATH products. MoldX P18 also gives a low viscosity that allows formulators to use a higher loading of ATH. Increased loading gives increased flame retardant performance and possibly eilimination or reduction in the amount of more expensive fire retardant additives. For more information, download our MoldX P18 Technical Bulletin by clicking on the image or to order a product sample, Contact Us! Huber Engineered Materials has the answer when it comes to reducing TiO2 in elastomeric roof coatings: SpaceRite® S-3 alumina trihydrate (ATH). It’s a high brightness, ultrafine particle size ATH grade designed to extend TiO2 in industrial coatings. To learn more about this flexible, high performing and unique ATH product grade, Contact Us today!